Apple has already led an assault on optical drives, now the company is trying to take away the keys on your computer’s keyboard. A new patent filed by the Cupertino based tech giant shows off the company’s latest plans for a virtual keyboard. 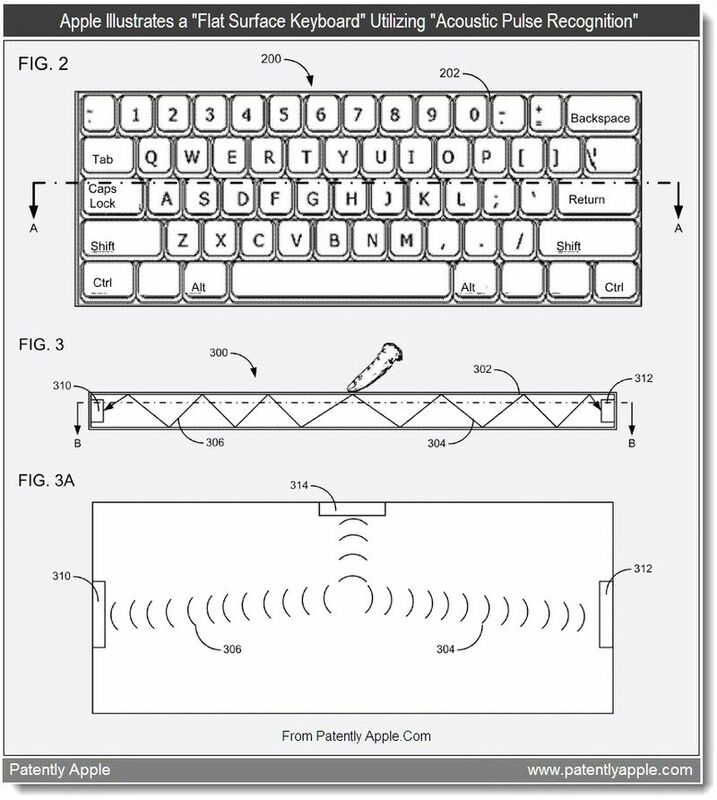 Apple has put out a slew of patents concerning keyboards since 2009. This latest application for patent entitled “Flat Keyless Keyboard for Desktops & More” was filed in 2010 and signed late last week. The application for a Keyless Keyboard intends to create a product that will address the unreliability of touch-sensitive surfaces or related input devices. The Apple inventors want to do away with command detection problems or devices that cannot distinguish when accidental commands arise. The solution? The leading idea in the application is a flat surface keyboard which may be constructed from metal, glass, plastic or any solid material. No more mechanical buttons or switches; the input will have few to no moving pieces. The flat surface input device will have a keyboard interface and utilize acoustic pulse recognition to realize when you’re typing. In the case of metal or plastic material, the keys will be stamped or micro-perforated on the surface. If glass is the decision, the keys can be painted onto the surface or as graphics displayed underneath the glass. The flat surface will provide a haptic or tactile feedback when the user taps on the keyboard. The acoustic pulse will be how input is received. Figure 3 shows three piezo-electric sensors included in the flat keyboard which will detect acoustic pulses generated as the user types away. The acoustic pulse recognition has the potential to be used in devices beyond an iMac such as in-vehicle systems and iOS devices or industry specific devices. In order to detect deliberate touch or functions such as letter capitalization, the patent also describes a combination of piezo and capacitive sensors. Further, the flat keyboard may have LED lights creating a grid on the flat keyboard to help when searching for a key. With the amount of research Apple has been doing unveiled in just 2011 alone, it shows that the company is serious about making our mechanical keyboards look like clumsy chimp-tools very soon.